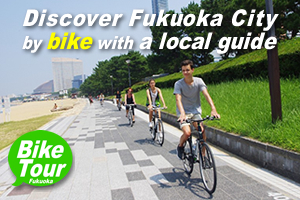 We offer custom one day tours from Fukuoka City in Kyushu. All tours are guided by English tour guides who are nationally licensed, experienced and quite familiar with Kyushu in Japan. There are great deal of charms and many destinations from Fukuoka City in Kyushu. For example, Dazaifu, Yanagawa, Itoshima, karatsu, Arita and so on. All places have a rich history, unique culture and great foods. 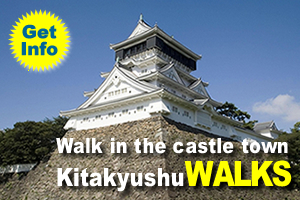 Our friendly guides help you to discover the places in Kyushu. Let’s enjoy our trips together! (3) Destinations: To be arranged at your request. For example, Dazaifu Tenmangu Shrine, Kyushu National Museum and an old temple nearby. (4) Detail and application: Please visit Dazaifu Trip on Fukuoka Walks website (our other website). (5) Inquiry: Please contact us by the website form. (3) Destinations: To be arranged at your request. For example, Boat riding, Ohana Museum & Japanese Garden and the shopping street. 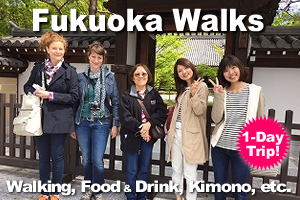 (4) Detail and application: Please visit Yanagawa Tour on Fukuoka Walks website (our other website). If you have any inquiries about other areas, Itoshima, Karatsu and others, please do not hesitate to contact us.